One of the many things I do during my week, besides making and blogging about my own ceramic art, is to help beginning ceramics students at nearby Cabrillo College in Aptos, CA. My special love is the handbuilding program, and this semester I volunteered in two classes taught by Kathryn McBride which met on Mondays and Wednesdays. I have a fairly long affiliation by now (25 classes worth, which I will describe sometime), and I have developed a delicious meta-awareness regarding the cycle of students and their passions, struggles and astonishments. We just finished a profound Finals Week. Folks, the depth of discussion in the Ceramics Lab was Graduate Level. By that I definitely do NOT mean slinging some highfalutin’ BS about one’s ART, but a real attempt to describe this convoluted process in individual terms: learnings and meanings. What happens, for example, when you think you’re in for an Easy A by Playing in the Mud, and instead you find yourself curious and caring, confused and committed? Chalk one up for the misconceptions abounding about clay! Happens all the time. Among the more common surprises to students is that there are hundreds of clay types, glazes and decoration possibilities and nearly as many firing options. Right now I would rank primitive pit firings as one of the most profound for students, electric and gas kiln firings as the most frustrating in terms of having to wait a long time for results and for NOT Getting What You Want, and Raku (pictured above) as the most terrifyingly giddy instant happiness ever. 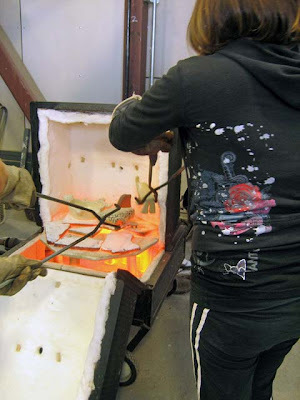 What you see in the photo is that exact Zen moment of aliveness: that glowing kiln full of redhot pieces, emitting insane heat and sparkling with melted-glaze works that students are removing with gloves and tongs to transfer to their prepared reduction cans filled with sawdust and newspaper shreds, to smolder and cool and turn the unglazed clay black and the glazed areas crackly and flashed with metallic highlights. At no time in a semester is there more presence and focus, except maybe when it is one’s turn in the Final to chat a bit about what happened to you in the past four months in Room 3013. In both cases, the observation of “how you do anything is how you do everything” is true. I am happy at the end of most semesters: it is good to start and it is good to finish. This semester I am bursting with joy from the students’ loving descriptions of their engagement with this whole huge magnificent endeavor, because it matches my own.